Now first off to all the traditionalists, no I am not one of those who thinks the DH is the greatest thing since sliced bread. And I too like the strategy that goes in to a manager decisions regarding the pitchers spot in the lineup. Heck Mike Matheny looked like a genius today by letting Lance Lynn hit in the Cardinals 13-7 win over Miami it was a nice move not to pinch hit for him. So having said that here is why I have sort of changed my mind a little bit when it comes to the DH in the National League. His name is Carlos Beltran, and unless the DH is in the National league, and unless the Cardinals are in no hurry to give Matt Adams the first base job permanently next year. The St Louis Cardinals are going to lose the guy who currently leads the team in HR’s. To me in the perfect world a lineup that features (and this includes the coming of Oscar Taveras), Beltran, Craig, Holliday, and Matt Adams is very appealing. So bash me NL purists all you want, but tell me you want to see Carlos Beltran go to an American League team and hit 20-30 HR’s. I don’t. The key word in the title being “team”, as in there is no one player that is miles above the other. The Cardinals have talent all the way down the lineup and it’s fun to watch. The fact that they are 20 games over .500 on June 11th is a testament to them playing as a team and not as a team relying on one certain player to carry the franchise. I am going out on a limb here but I think this may be the best team the Cardinals have had since 2004 and that team didn’t win the World Series. I like how there is no real easy out on the roster. If I have one complaint, and it’s not a large one it’s that the youth movement at pitching. Don’t get me wrong I like the Shelby Millers, Michael Wachas, Seth Maness’s of the world but I do sometimes worry about them over the long haul. I hate to say it but I think the Cardinals may possibly have to be active come trade deadline time. I hope I’m wrong but no matter what happens the rest of the year. This is a special team. And I write this even after the Cardinals lost to the Mets 5-1 tonight. I still have faith that the St Louis Cardinals will end up a record setting team. I’m backkkkkkkkkkkkk, yes kids I’m back to blog. It’s been awhile, long story short I worked from home and my desktop was hooked to a work computer and I couldn’t blog. That is another story in itself. We as Cardinals fans have something special in Yadier Molina. We had something special in Albert Pujols before he took his ball and talents to Southern California and he will forever be known as just a really good ball player but not a legend. There will be no statue in front of Busch of Albert, but I feel that if things go the way they are going there will be on of Molina. Now of course this is all speculation on my part, but I think that at this point Molina will end up his career with the Birds on the Bat, and that makes him not only a special player but the city of St Louis has a love affair with him. Just go on twitter and see the argument over who’s the better catcher Yadi or Buster Posey. For my money Yadi (and here is me playing the homer card) is the complete catcher who is just now starting to discover power in his bat. Look at how many players dare not run on him or do and soon regret it. His gold glove totals are a true testiment that he is an excellent catcher behind the plate. And the little things he does, like call a great game for young pitchers like Shelby Miller. His reluctance to not see his name in the every day lineup, all things that endear him to Cardinal Nation. So to me we have something special in Yadier Molina. I’ll never forget where I was when Bruce Sutter recorded that final strike out in the 1982 World Series. You see I had signed up and joined the United States Marine Corps and during the 1982 World Series I was in basic training in San Diego California. Now I did not see the final out live mind you, but I got to see the final out. Back then you all heard of VCR’s, well I was about to watch a training film in basic training on, well to be honest I don’t remember what. But what I do remember is that the tape was at the end of the tape, so when the Drill Instructor put the tape on rewind the TV went to live TV where they showed that final out! So here I am thousands of miles away and getting what we called “thrashed”. Thrashed meant exercised until we passed out from pain. So here was my platoon sitting in the “classroom” waiting for the tape to rewind. Remember how long those darned tapes took to rewind, well I do now. Because when the tape was rewinding and I saw that final out I yelled something somewhere along of the lines of “OH YEAH!” Well my drill instructor was not too keen on that so I was “thrashed” the entire time the tape was rewinding. It felt like forever! But it was worth every single, push up, sit up and what we called bends and thrusts (trust me those hurt!) So the tape finished rewinding and I got to sit and be trained again on what I can’t even remember. But I’ll never forget that feeling of both pain (from the exercises), and joy! The 1982 World Series Champions St. Louis Cardinals! “You can’t depend on who you don’t have, depend on who you do have. The only person not in a Cardinals uniform that is truly missed is Dave Duncan.” Those words were delivered by Tony LaRussa during the Cardinals 5-1 victory Saturday over the Cubs. The one player that Tony did go out of his way to praise was one Yadier Molina, who on cue smacked a single then proceeded to steal second base (who saw that coming? raise your hands and be honest). Then scored on Matt Carpenter’s triple. This “team” continues to impress and now that the jitters of the home opener are out of the way, and that’s what I attribute yesteday’s 9-5 loss was, jitters. And even in defeat the Birds still showed they can score runs. Today was another example of the bats showing up, and that is without both David Freese and Lance Berkman both nursing injuries yet the Birds did still play long ball with Jon Jay’s 2nd home run of the season. 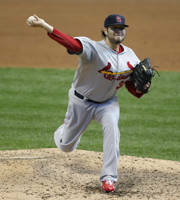 Lance Lynn (2-0) got another victory in his stint as Chris Carpenter’s stand in, and the bullpen did their job. The crowd got a nice day weather wise, once the rain let up and were treated to a beautiful ring ceremony and a nice team performance. So a 6-3 start and still in first place, and a Sunday game that will be seen by all (Thank You AT&T and U-verse for working things out with Fox Sports Midwest). I look forward to seeing the game tomorrow and look forward to the second outing by Jake Westbrook. Here’s to another Cardinals victory. For those of you that got to watch last night’s game between our St. Louis Cardinals and the Cincinnati Reds, I of course was not one of them as I am held prisoner of the AT&T/U-verse squabble with Fox Sports Midwest. Well for those of you that got to watch, you got to see the Cardinals break out more big sticks. Home runs by Matt Holliday, David Freese and Yadier Molina helped in the 7-1 thumping of the Reds. The lone run by the Reds was unearned for winning pitcher Jake Westbrook, who looks every bit as good as he did in Spring Training. The trimmer Westbrook went 7 strong innings and after a bit of a rocky start with 4 BB and an error to get the win. The Cardinals bats look really good this early on into the 2012 season. It would be crazy to expect the bats to keep up this pace, but for now I think this team looks every bit better than the team that won the World Series. So game two tonight pits Kyle Lohse (1-0 2.23 era) takes on Reds starter Mike Leake, and for those that get to watch tonight I commend you. As an AT&T/U-verse subscriber I will be forced to see highlights on MLBNetwork and listen to Mike Shannon, not that that part is a bad thing. But still I’d like to actually “see” the game, but as long as the greed that is AT&T and their refusal to pay what Fox Sports Midwest wants exists. I am stuck like a lot of other Cardinals fans out there who are frustrated just like me. Well we all knew that Chris Carpenter’s injury meant we would be without his services for an unknown amount of time, and as a fan of the Cardinals that worries me. But today my worries, for now anyway, are at ease. Enter Lance Lynn, who filled in for the Bulldog quite nicely. Lynn’s numbers 6.2 ip 1 er, 8k’s and only one BB was enough to get the Cardinals (3-1) off to a good start in the Mike Matheny era. Lynn may not be the Bulldog, but for today he was the other bulldog. I like the vibe of this team, a team that is still very overlooked by the experts. Heck even in the 4 games I’ve heard Albert Pujols name more than Carlos Beltran, even though Beltran has 2 more home runs than Pujols (2 to 0) and has looked every bit worthy of the money the Cardinals wouldn’t have spent had they been handcuffed with that large contract. I look forward to the day that the Cardinals can go a full nine innings without mentioning #5 every inning. And let’s hear it for the young guys, Shane Robinson, Matt Carpenter getting starts and looking very good out there. Robinson’s home run in the 9th, a 3 run shot that was his first career home run to boot. Not to take away from Tony LaRussa, but I don’t think he would have seen the plate this early in the season. Hats off to Mike Matheny for having faith enough in his young guys to help give guys like Berkman and Yadi a nicely deserved day off. Even though Yadi did come in late, it was still a nice change. So this team, that many say can’t repeat are off to a 3-1 start having taken two of three from the Brewers, and are now off to Cincinnati where we get to see Jake Westbrook. If his Spring Training numbers are any indication, tomorrow night could be good. I think Cardinals Nation is in for a heckuva ride.